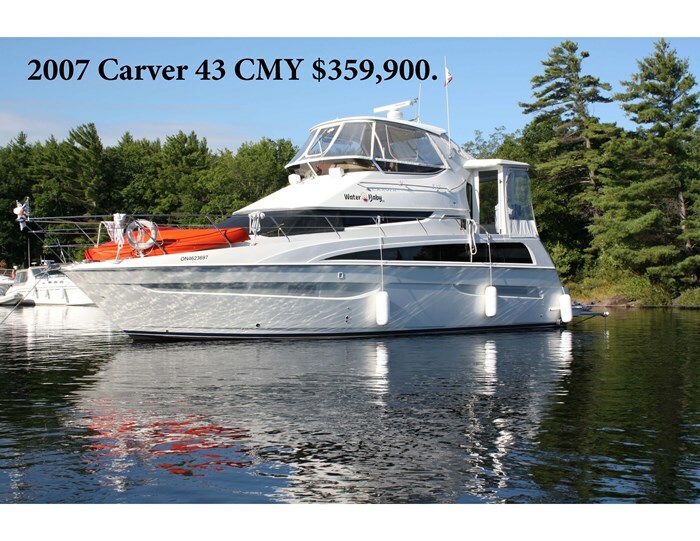 Here is the finest example of a Carver 43/47 Motor Yacht you will find. 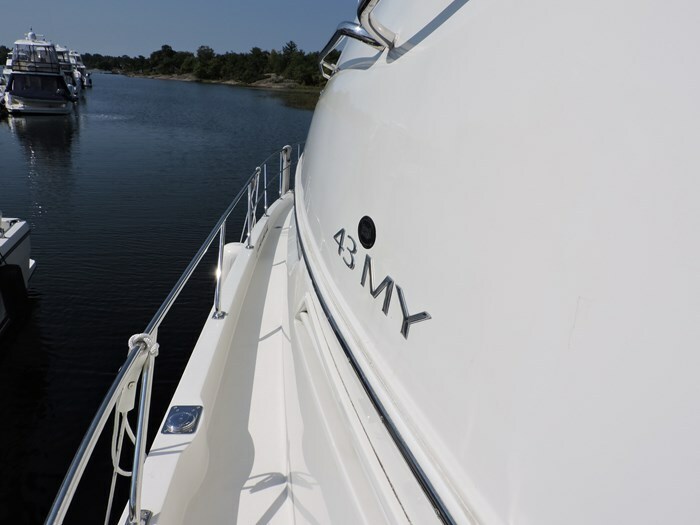 Pride of Ownership is evident from Bow to Stern ands she is equipped for extended journeys from shore. 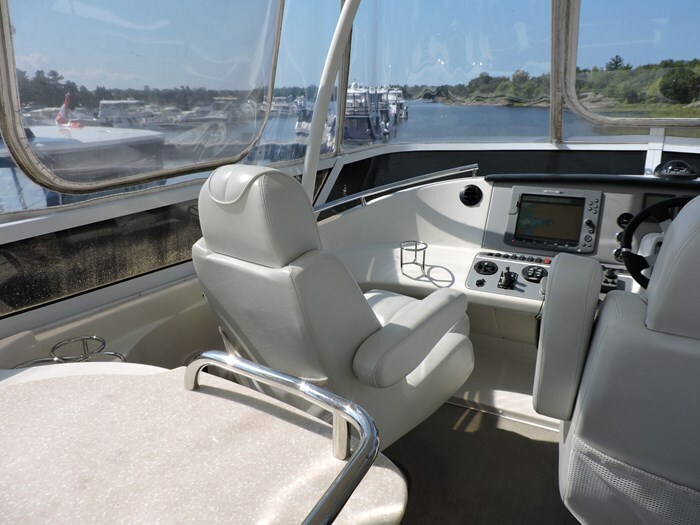 This model was Carver's last and best ever Motor Yacht design. 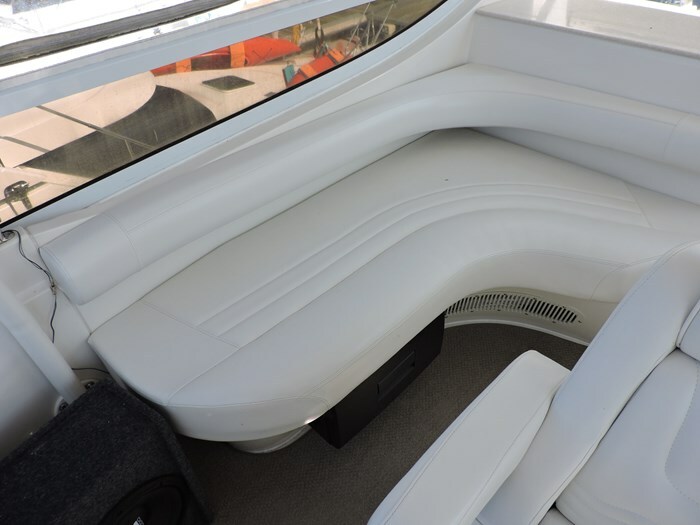 Carver enlisted BMW designers to create the most modern looking Motor Yacht design on the water. 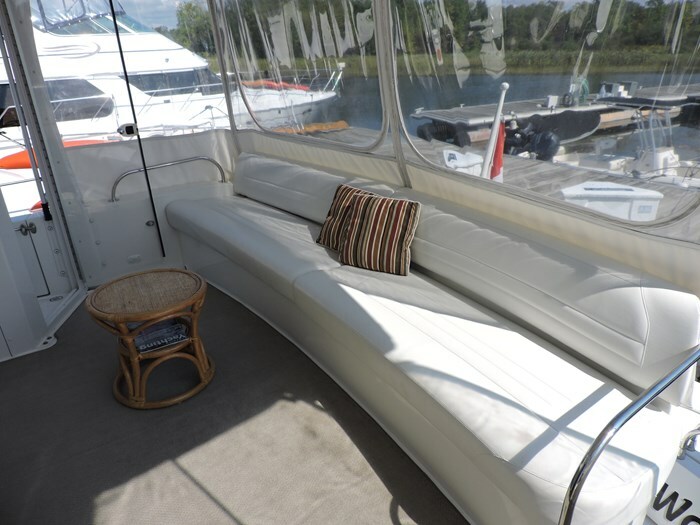 This Yacht was purchased from the local Carver dealer at the time and has only ever boated in fresh water. 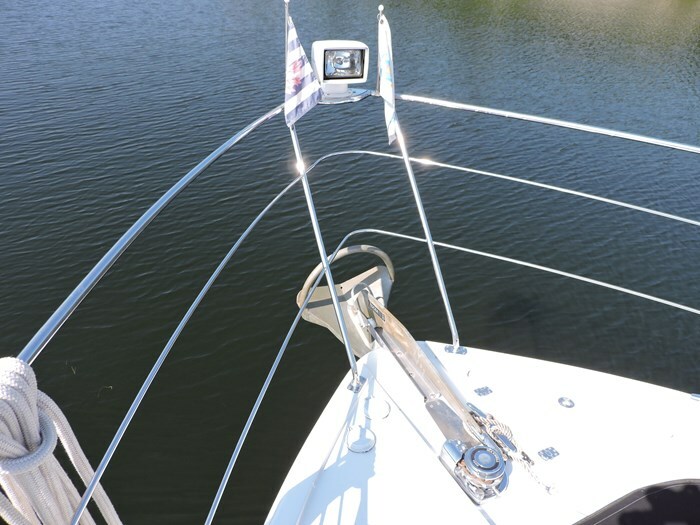 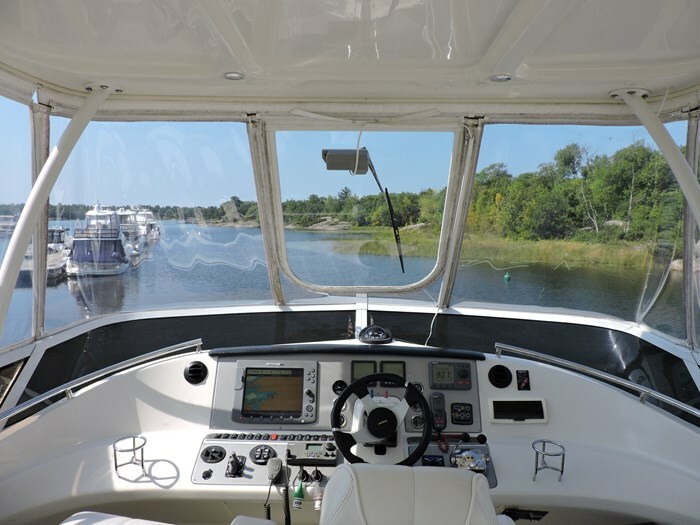 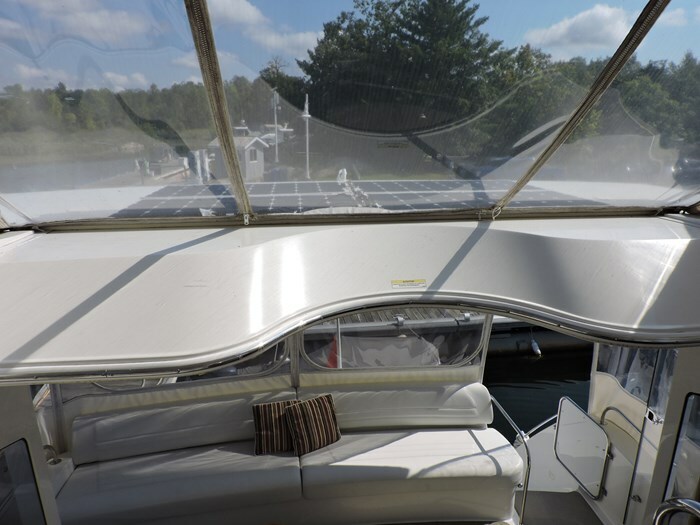 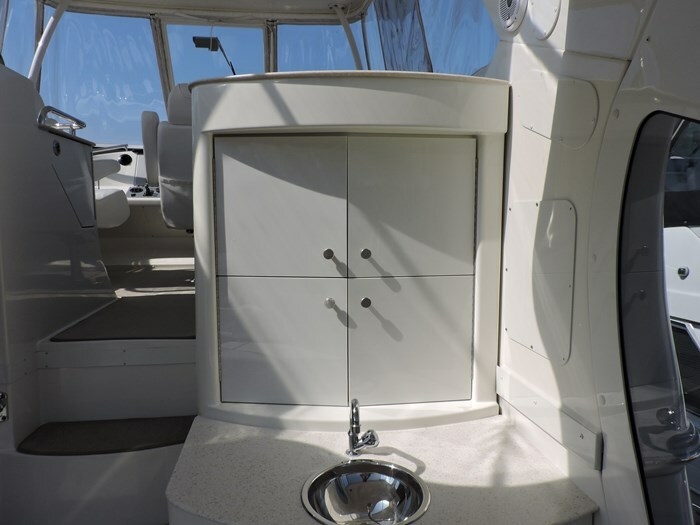 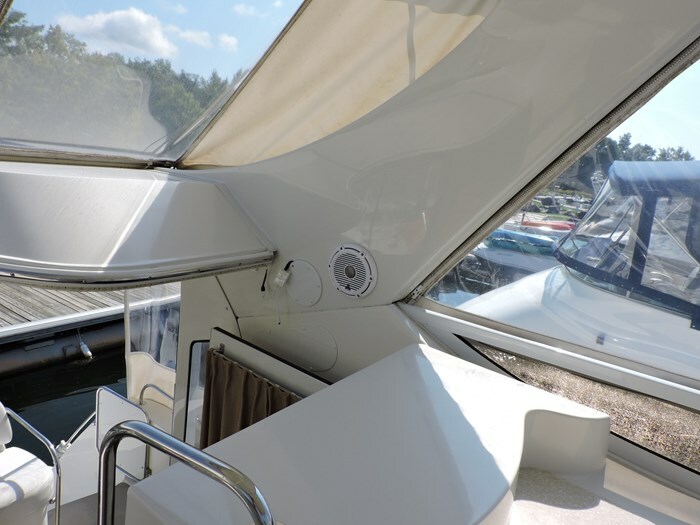 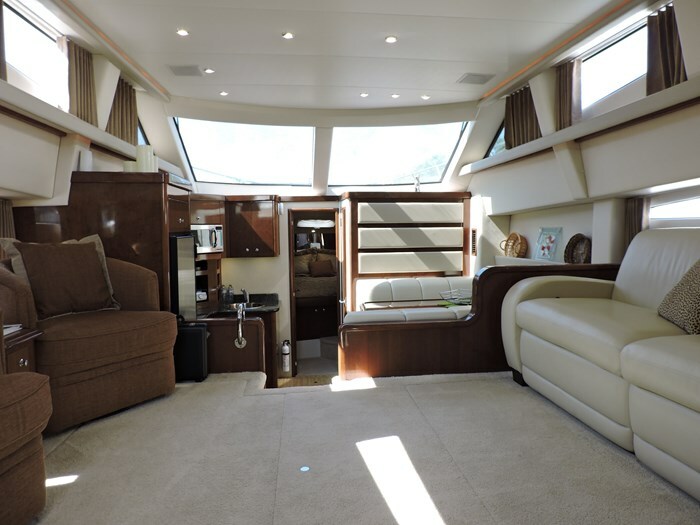 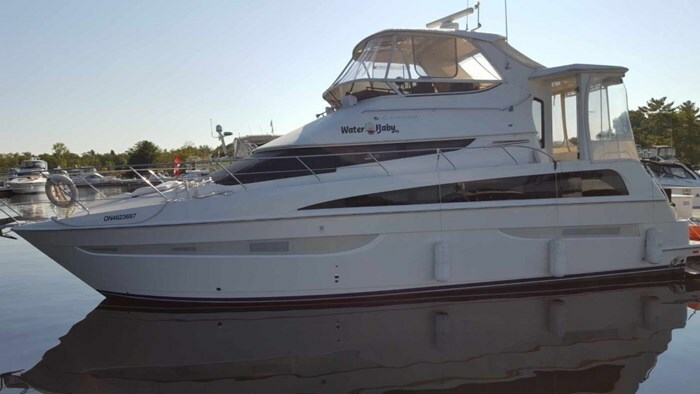 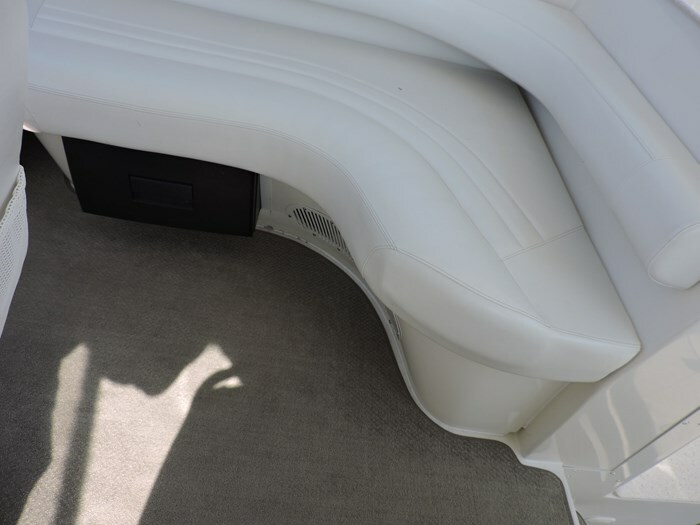 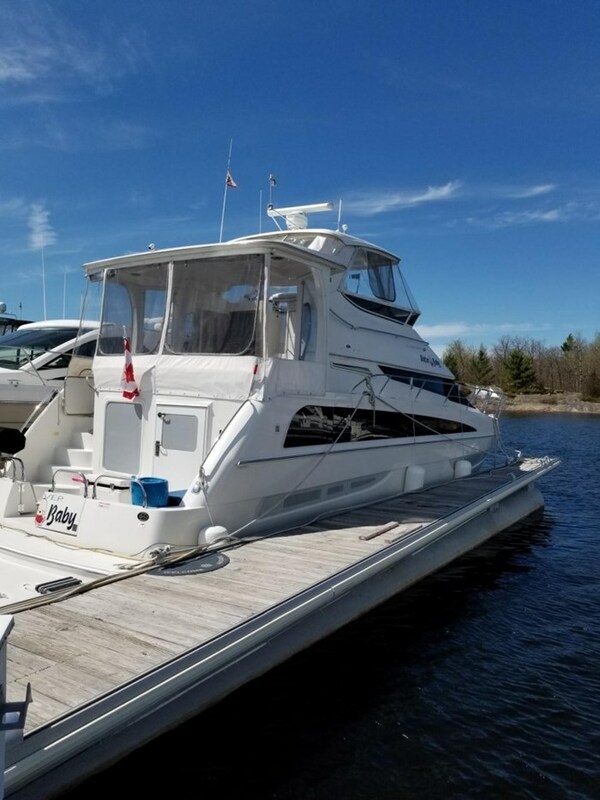 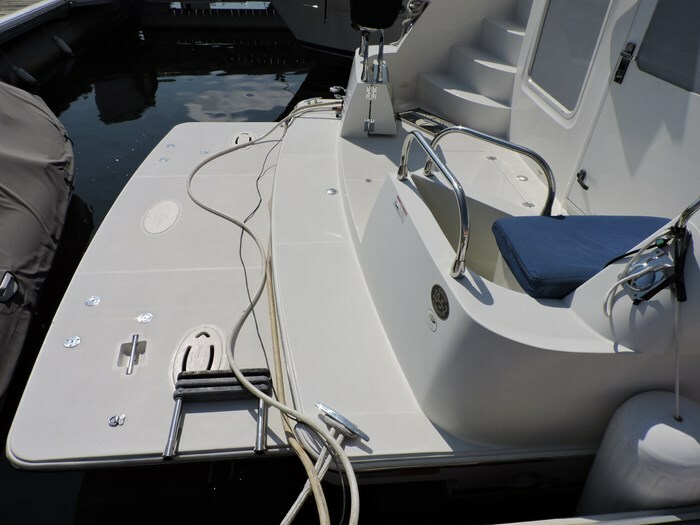 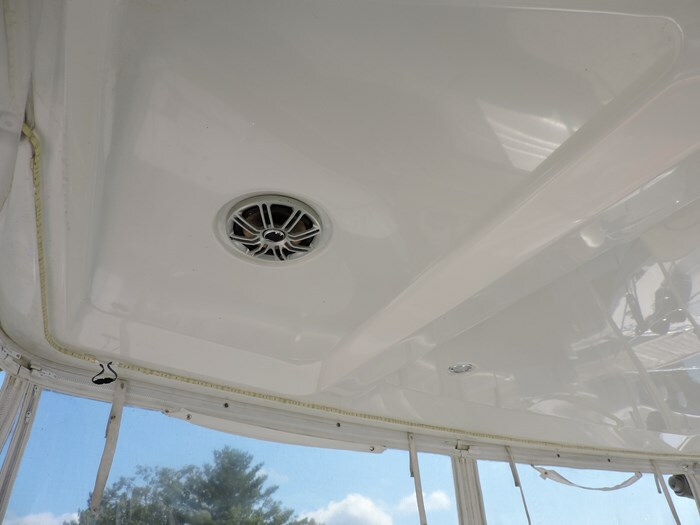 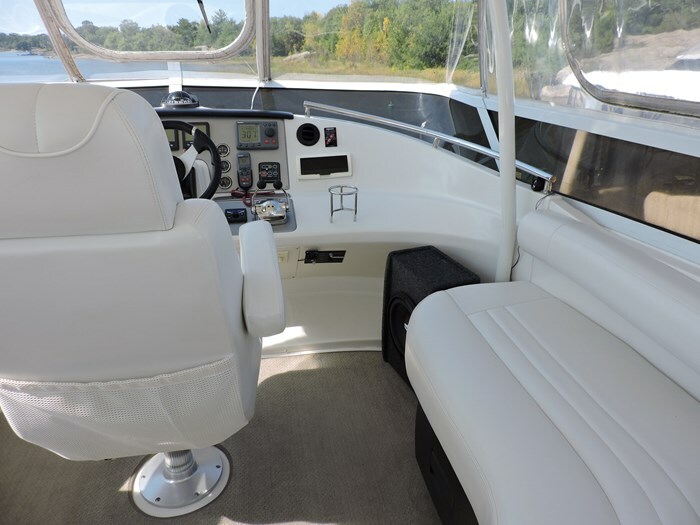 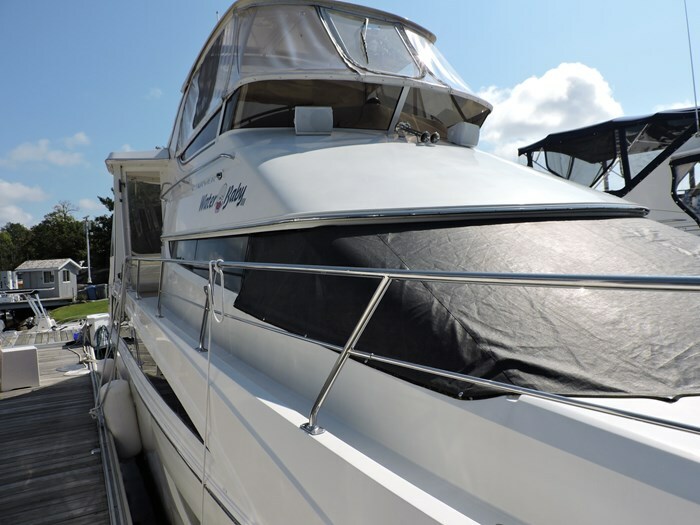 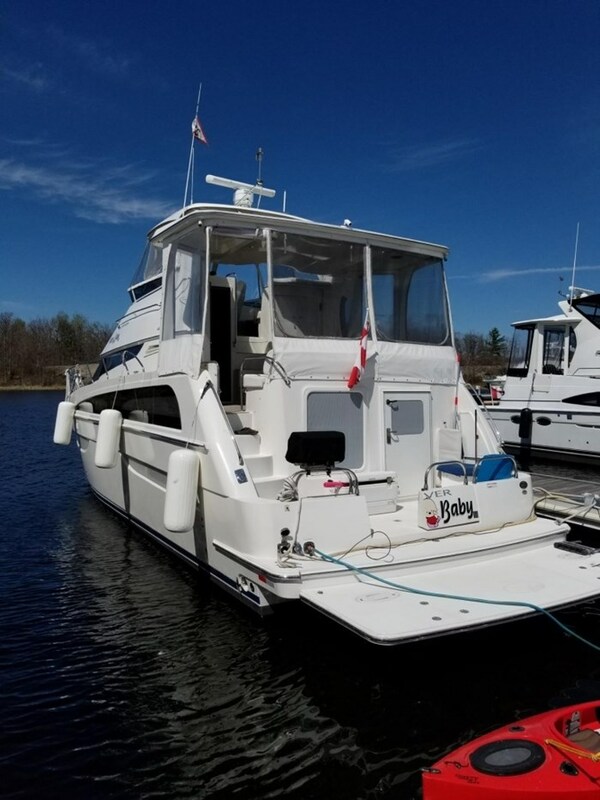 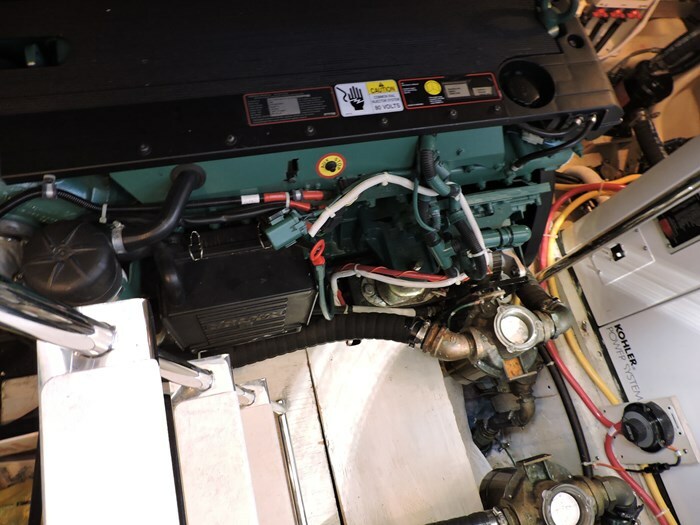 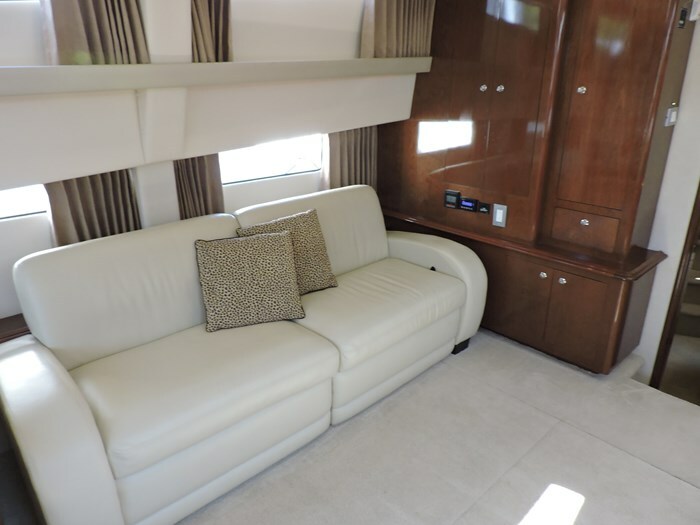 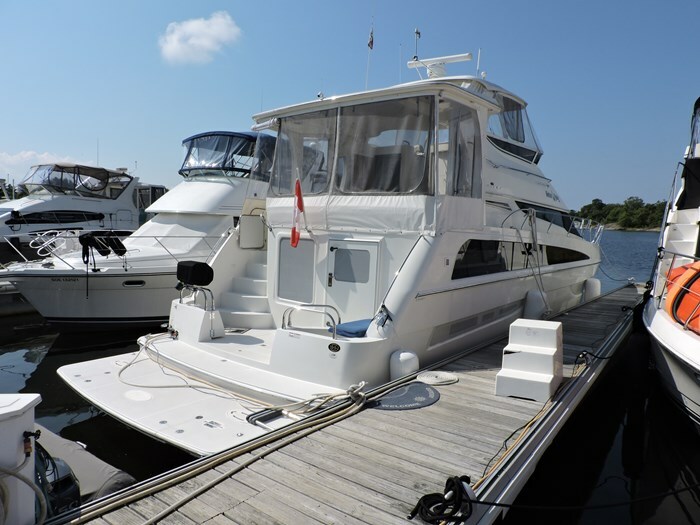 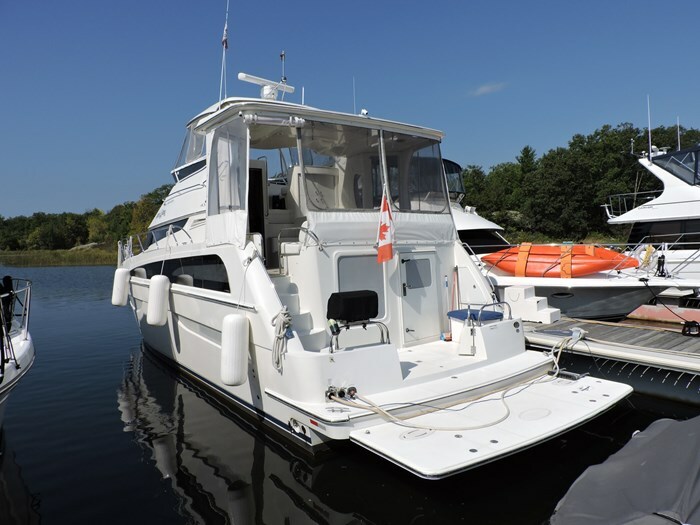 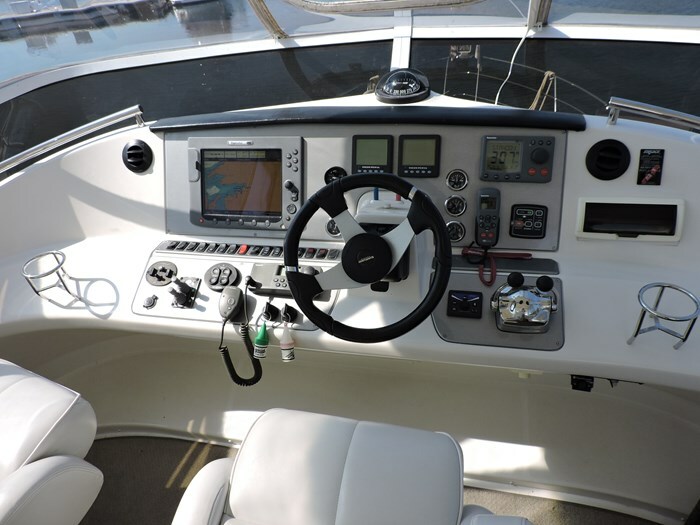 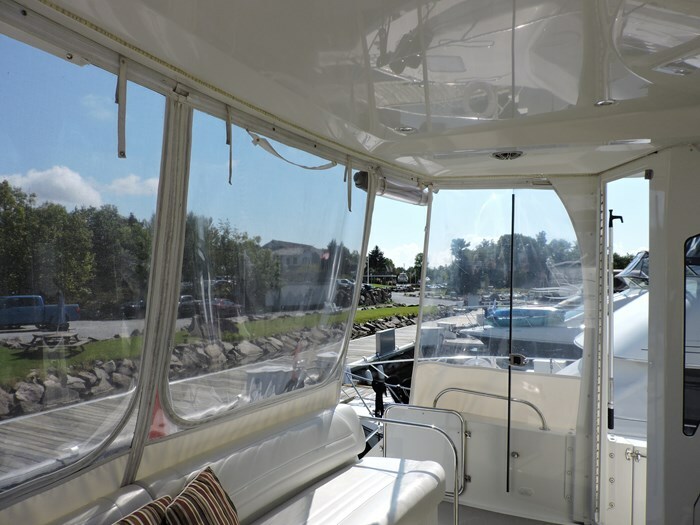 Many Custom Features Including a Dealer Installed oven, 400 Watt Solar Panel Charging System and Flybridge Windshield Wiper. 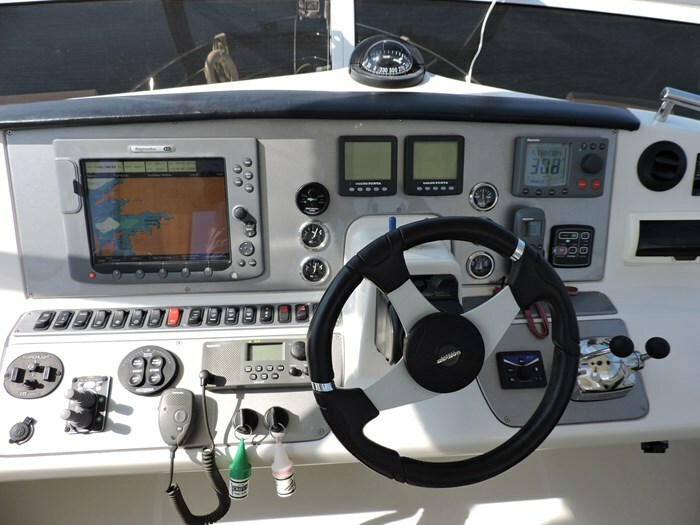 Navigation-Raymarine E120 Multifunction Display, Radar, GPS and Chart Plotter, Autopilot, Back Up and Engine Room Cameras, Compass, Engine Synchronizer, Full Engine Instrumentations, Horn, Navigation Lights, Remote Spotlight, Rudder Angle Indicator, VHF Radio, Custom Clear View Windshield With Wiper. 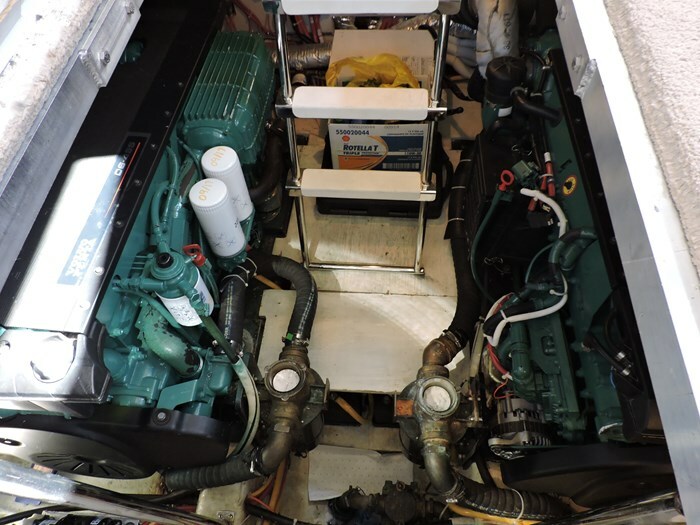 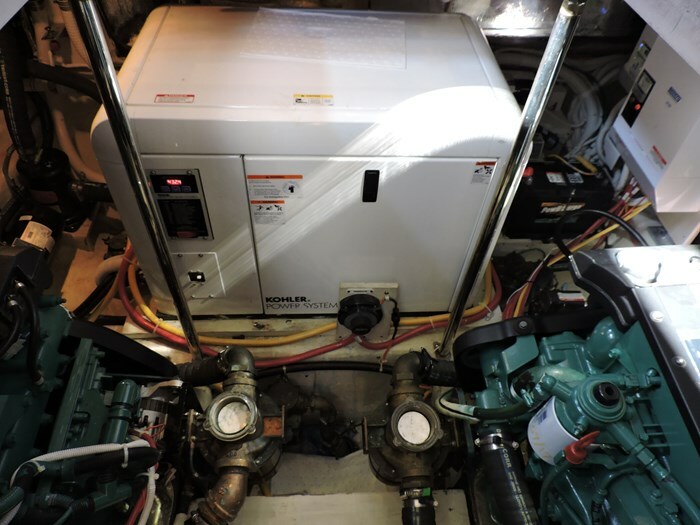 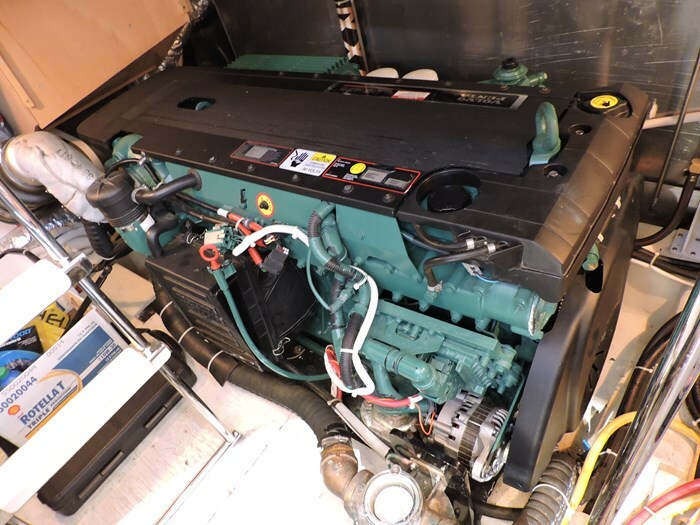 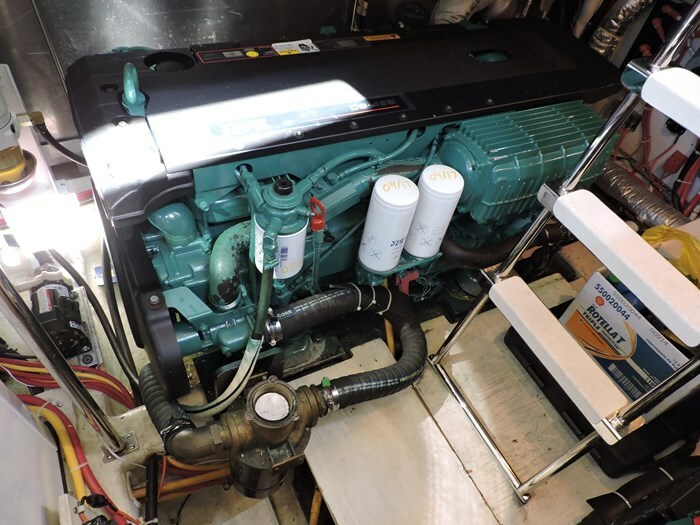 Systems-400 Watt Charging Solar System, 110V Hot Water, 12V Outlet, AM/FM/CD Stereo, Anchor Windlass, Auto Oil Changer, Automatic Halon, Batteries With Charger, Battery Isolator Switch, Bilge Pumps and Blowers, Bow and Stern Thruster, Bridge Stereo, Central Vacuum, Diesel Generator with 435 Hours, Dockside Water, Fresh Water Washdown, Glendinning Cable Master, Heat Exchanger, Hour Meter, Hydraulic Trim Tabs, Knot Meter, Master Stateroom TV/DVD/Stereo, Overboard Discharge, Pressure Water, Remote Spotlight, Reverse Cycle Heat and Air Conditioning, Flybridge Reverse Cycle Heat and Air Conditioning, Salon TV/DVD/Stereo, Second Stateroom TV/DVD, 50 AMP 240 Volt Shorepower with Cord, Surround Sound Stereo, Tilt Steering, Transom Shower, Waste and Water Gauge. 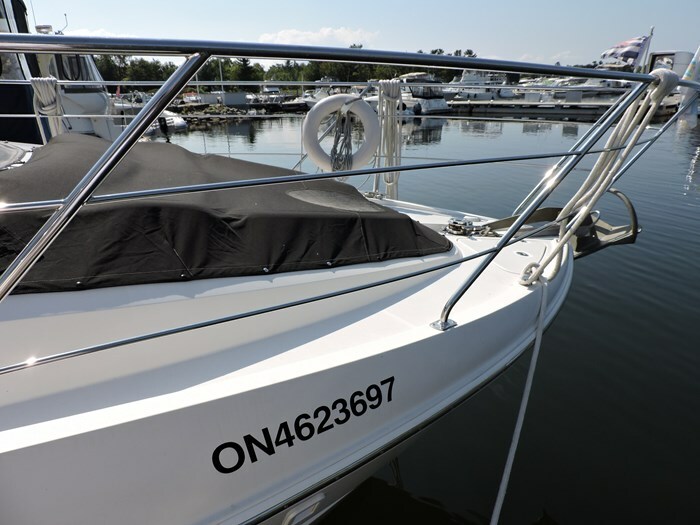 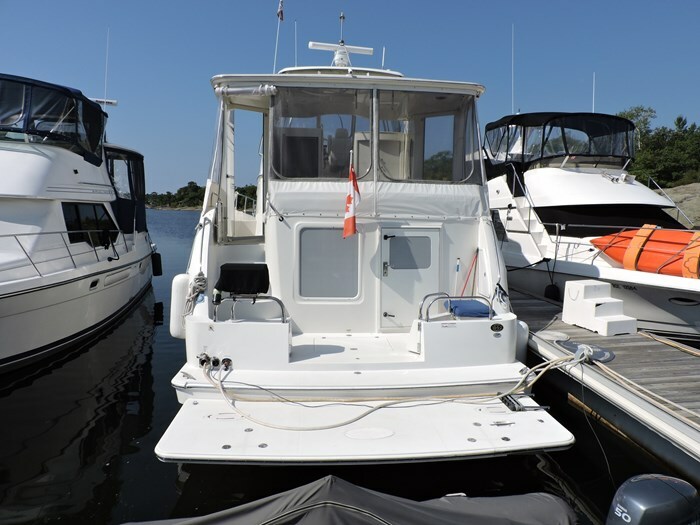 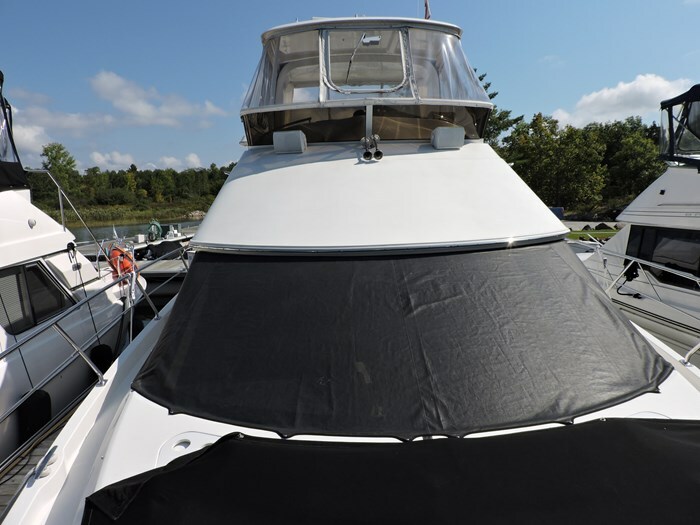 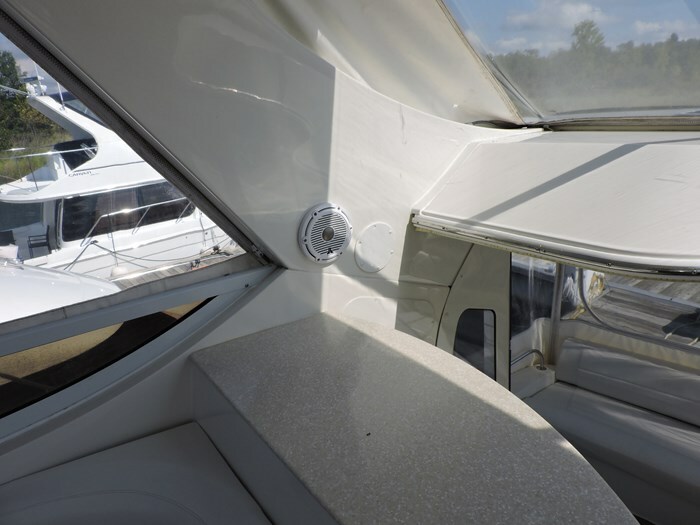 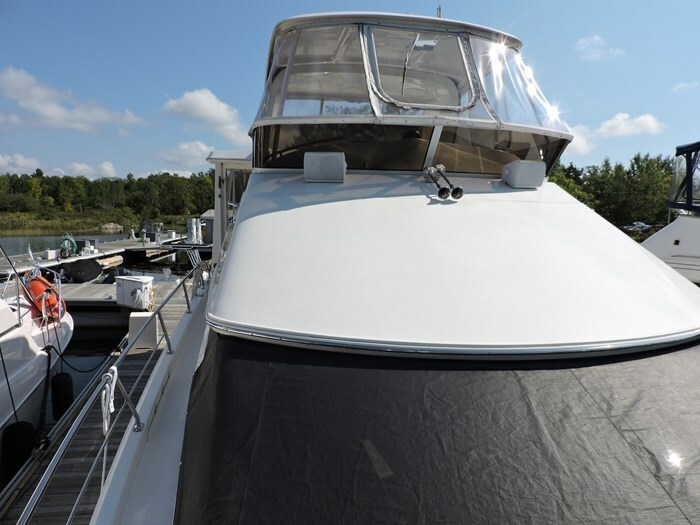 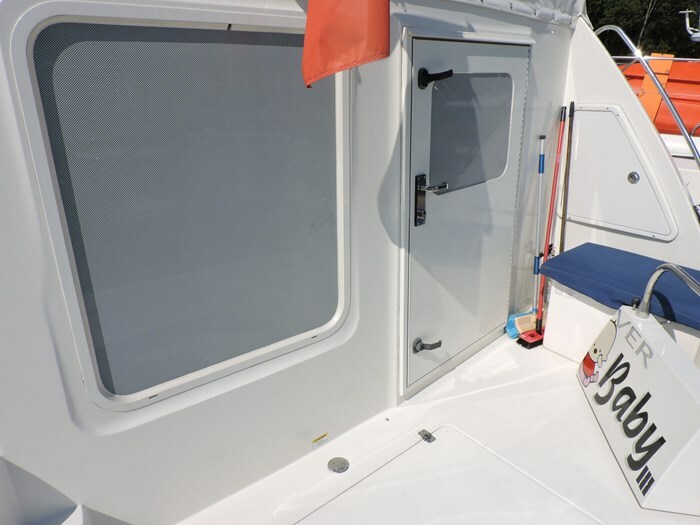 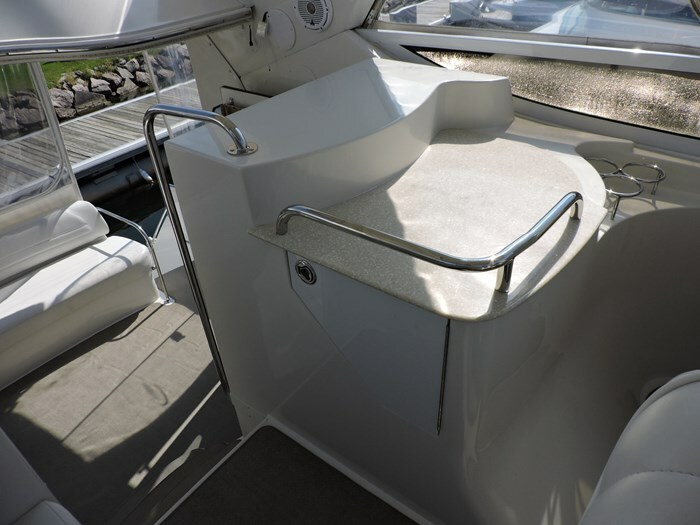 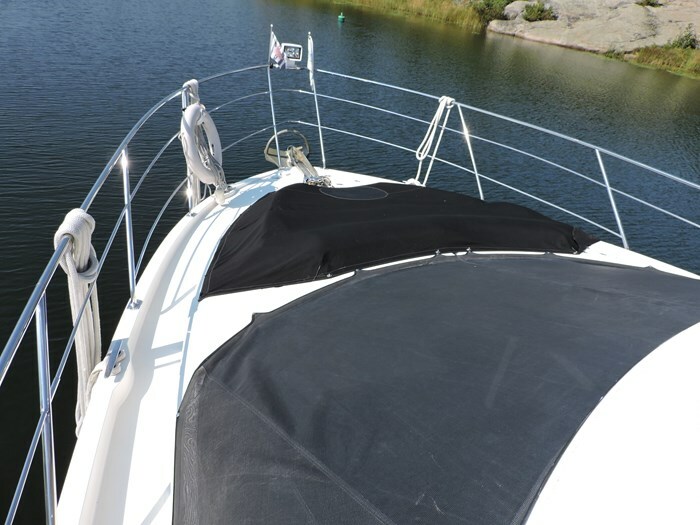 Exterior-Adjustable Helm Seat, Anchor Roller, BBQ, Flybridge and Aft Deck Hardtop with Full Enclosure, Bottom Paint, Bow Pulpit, Bow Rails, Courtesy Lights, Foredeck Sunpad, Extended Swim Platform, Exterior Fridge, Exterior Removable Carpet, Exterior Wetbar, Fiberglass Cockpit Liner, Swim Ladder, Weatherboards, Wing Doors. 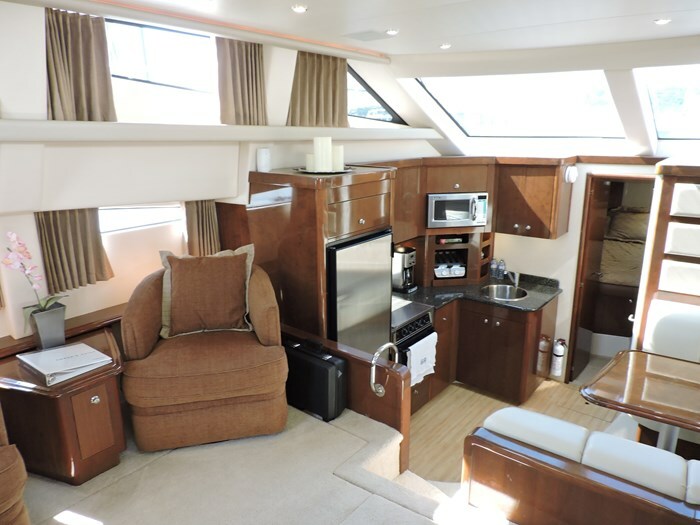 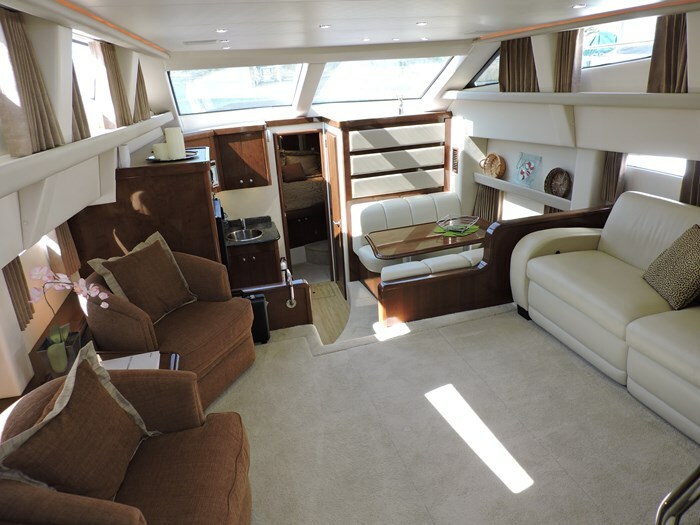 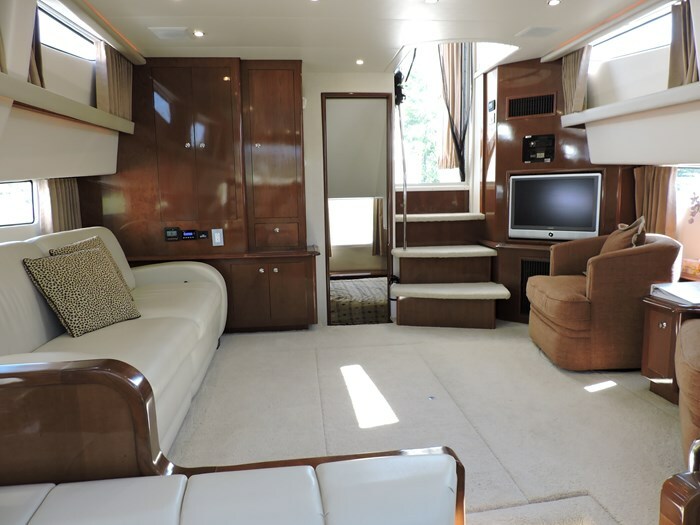 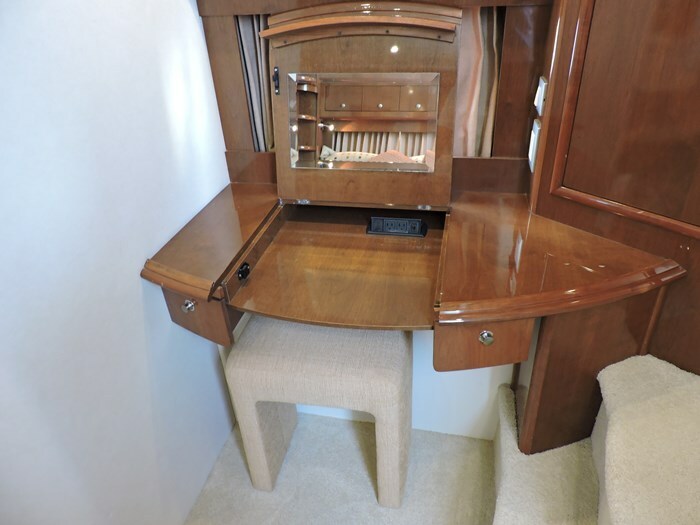 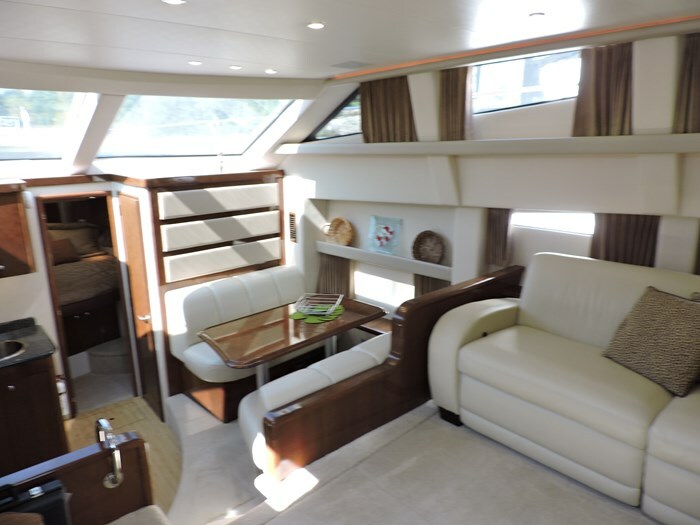 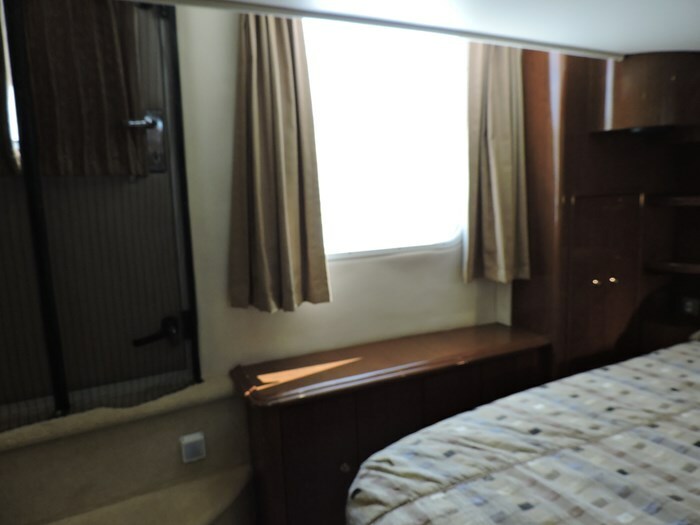 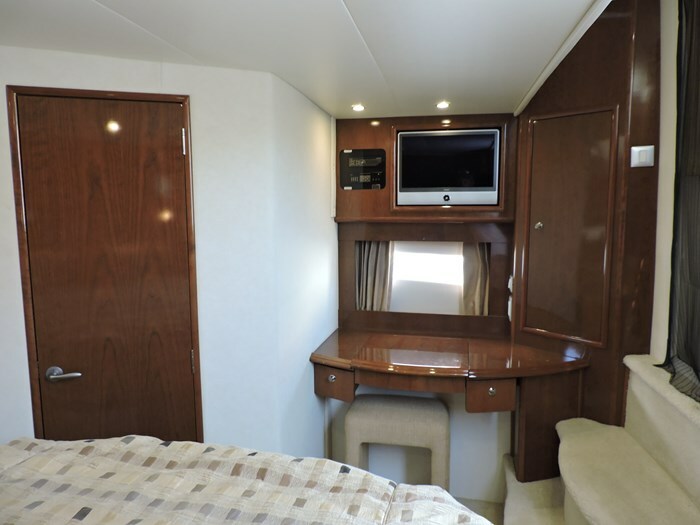 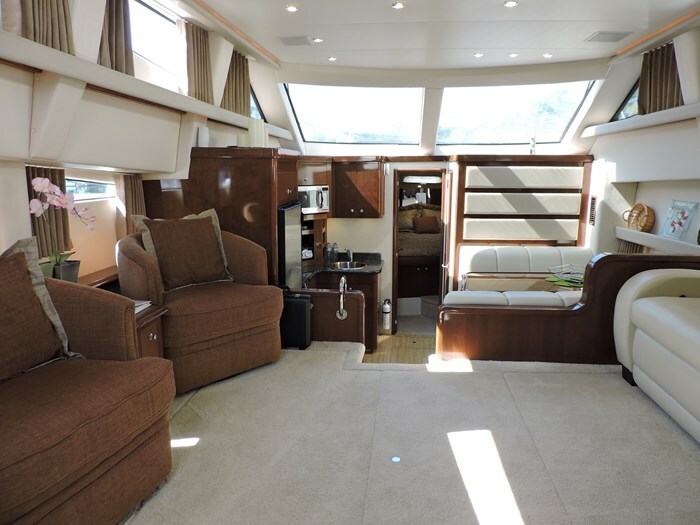 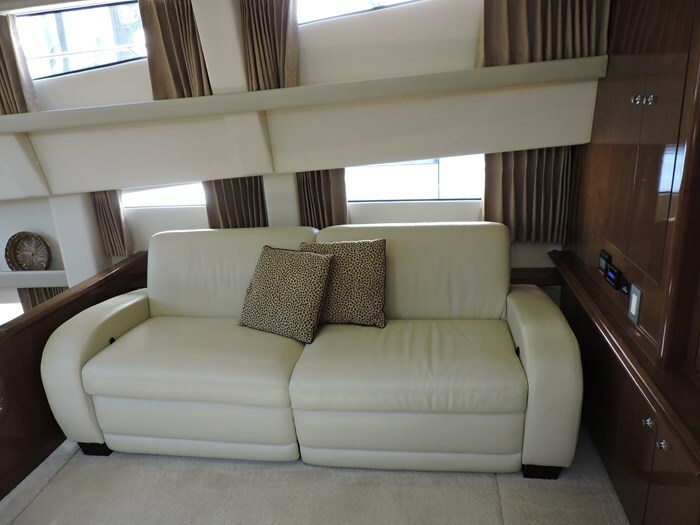 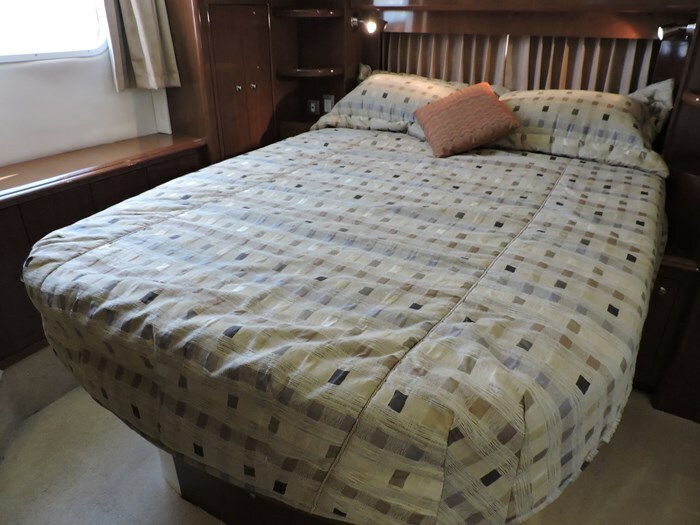 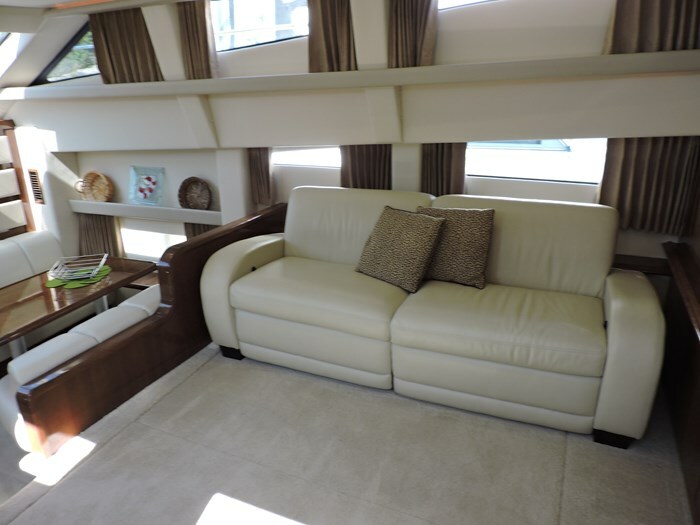 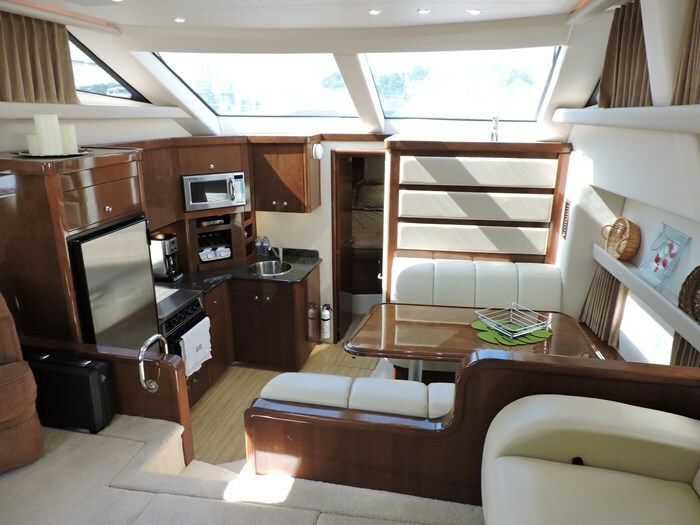 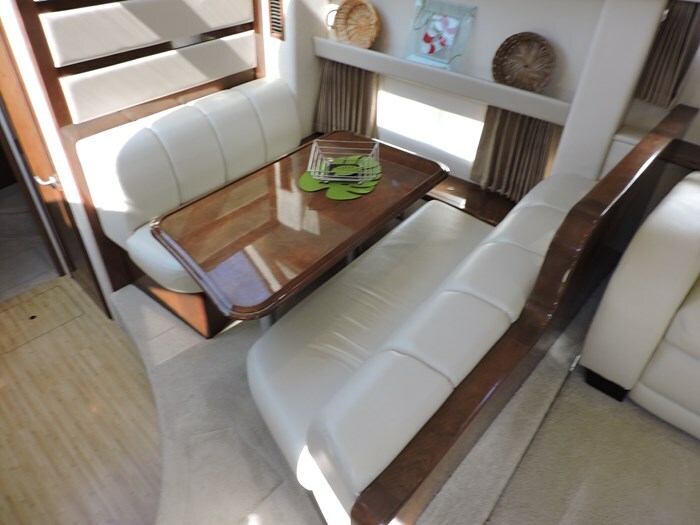 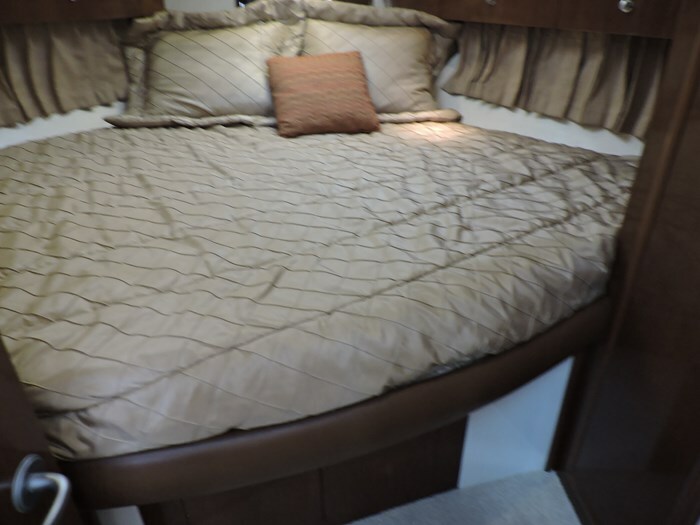 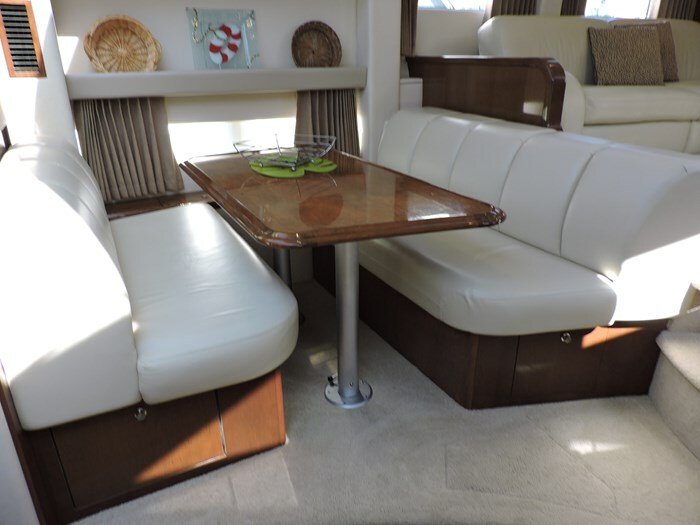 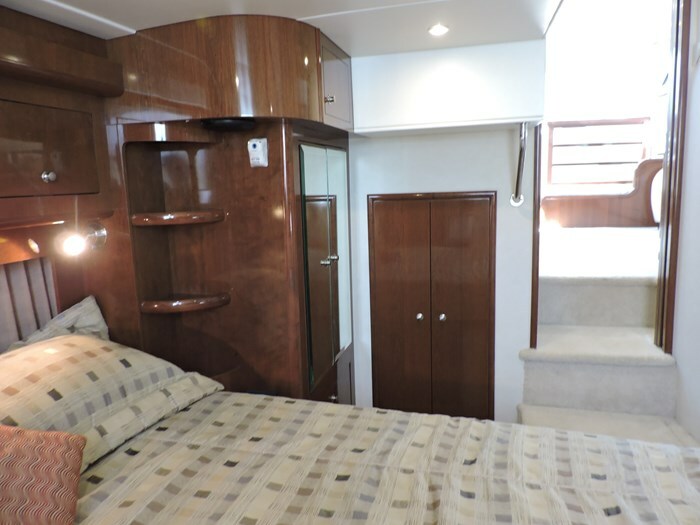 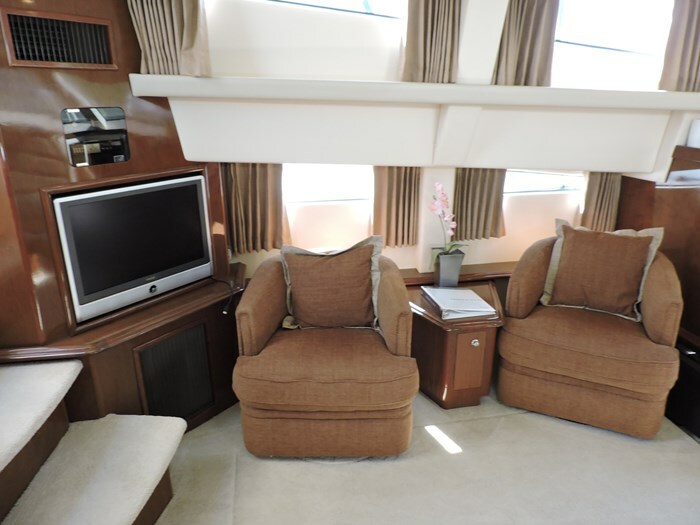 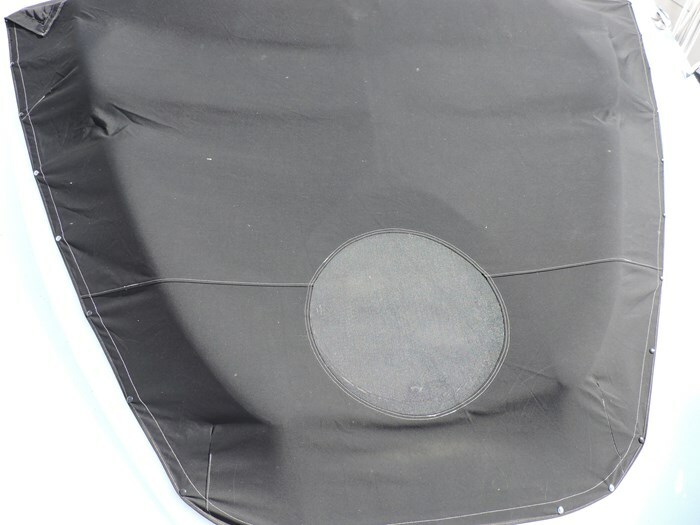 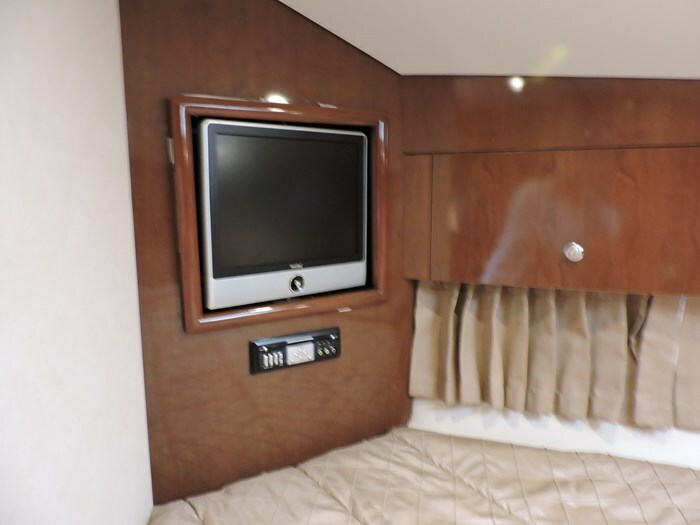 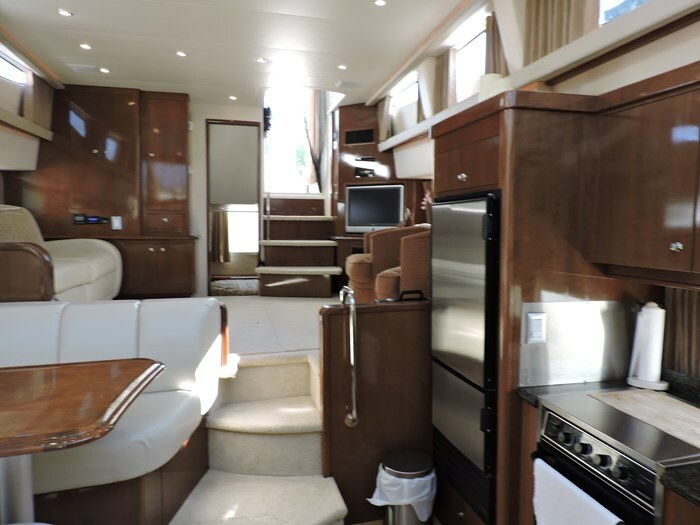 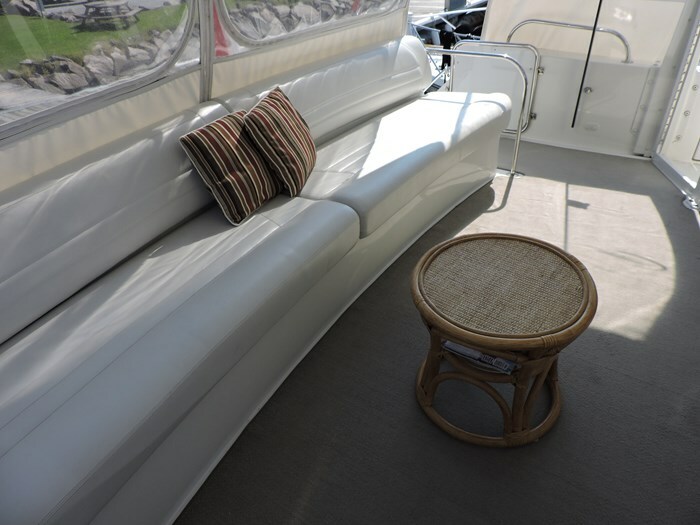 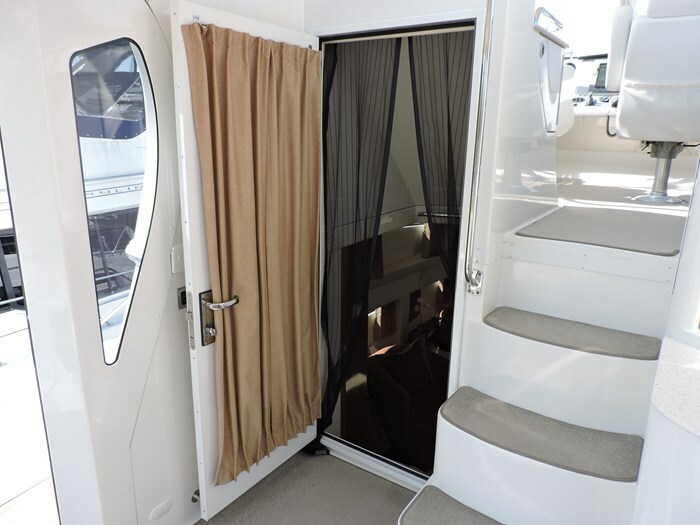 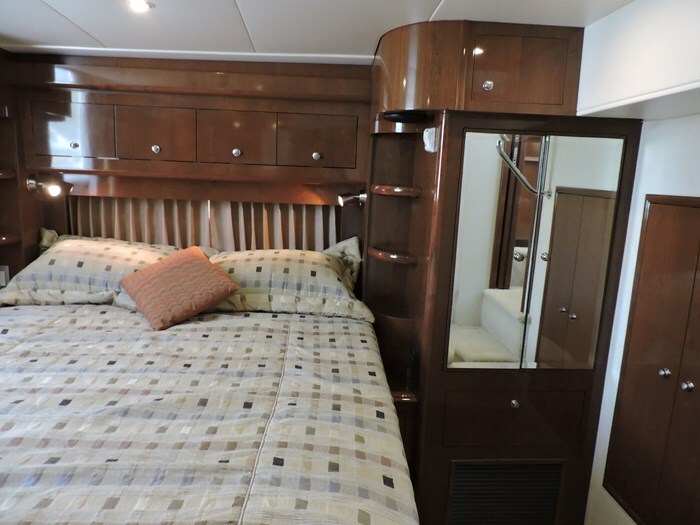 Interior-Cabin Carpet, Cabin Lighting, Curtains, Deck Hatch, Mini blinds, Portholes, Salon Chair, Salon Sofa with Recliners. 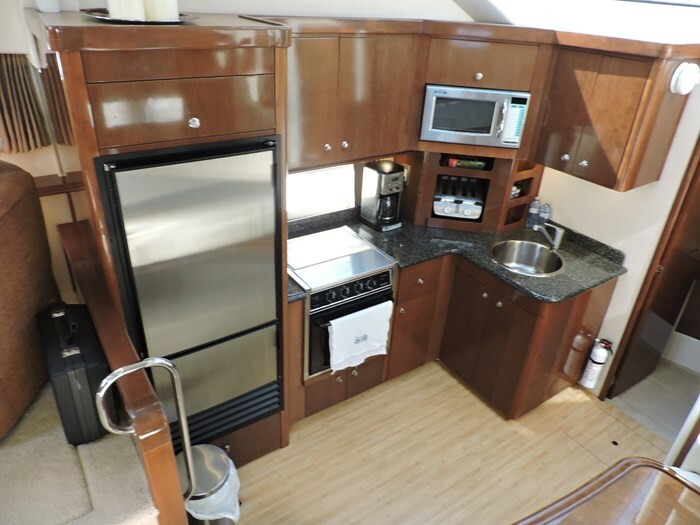 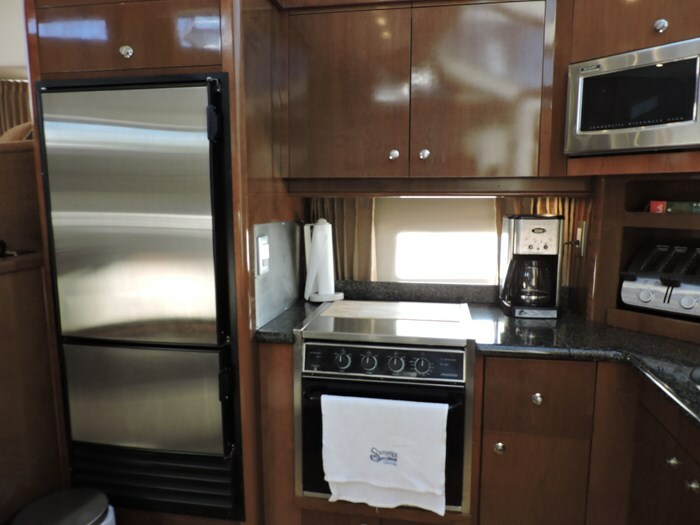 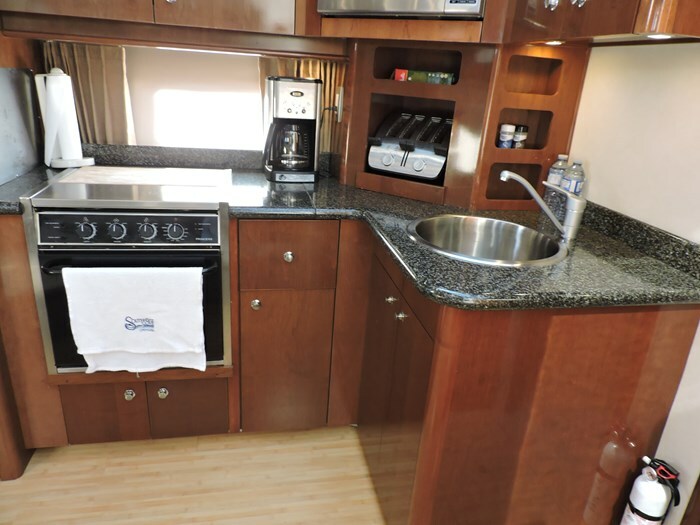 Galley-Coffee Maker, Dinette, Fridge/Freezer, Microwave, Oven, Sink, Stovetop. 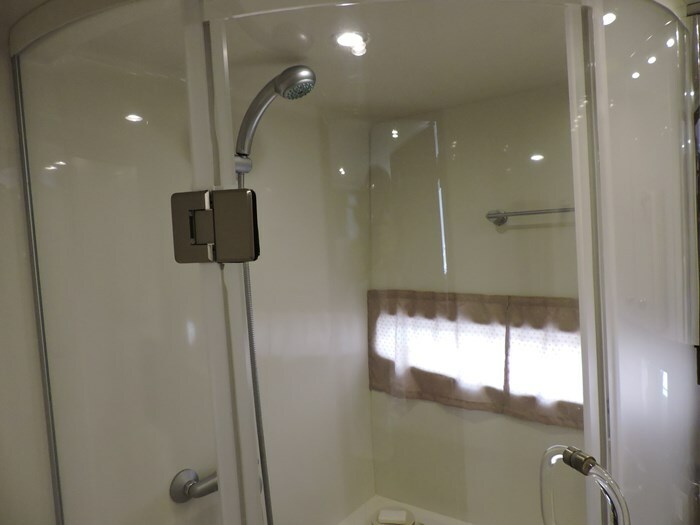 Master Head-Vacuflush Toilet, Stall Shower, Exhaust Fan, Vanity, Sink, Mirror. 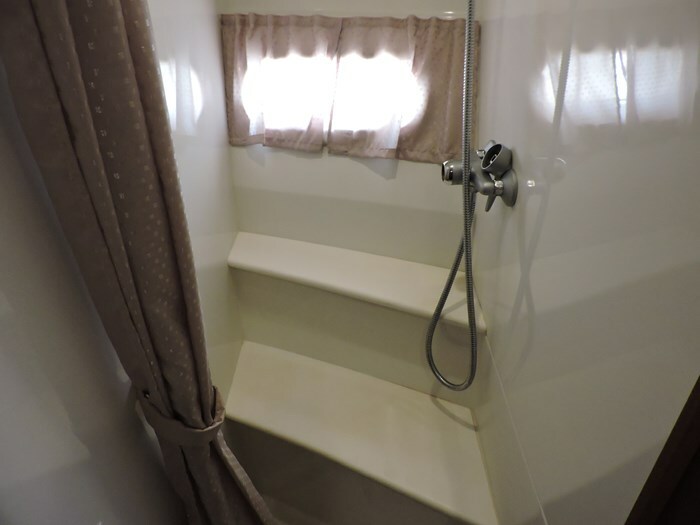 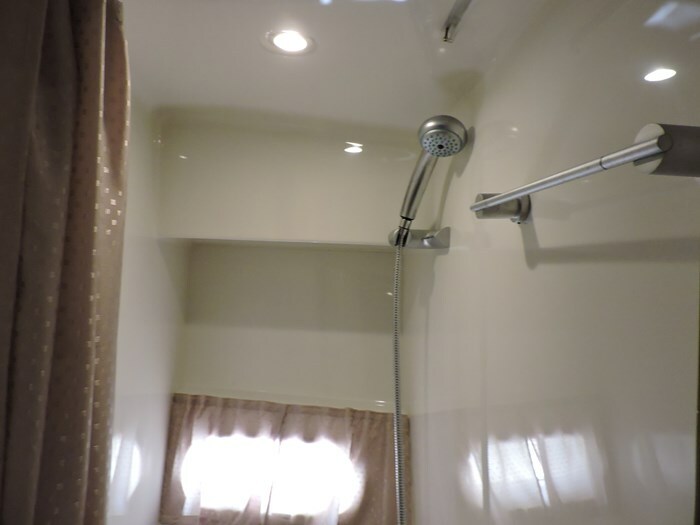 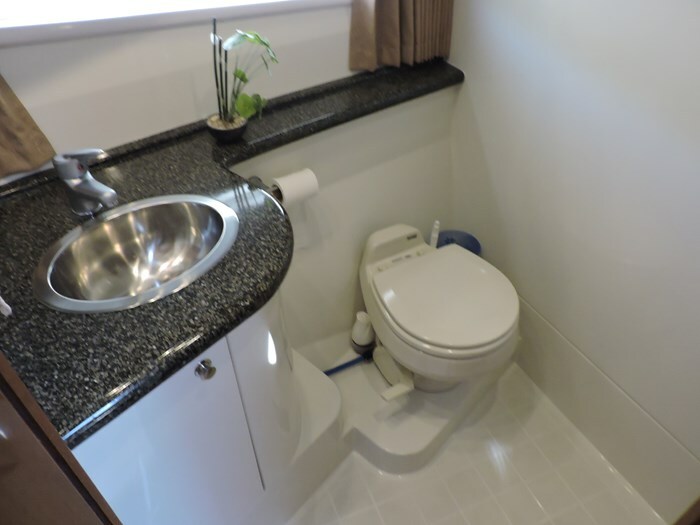 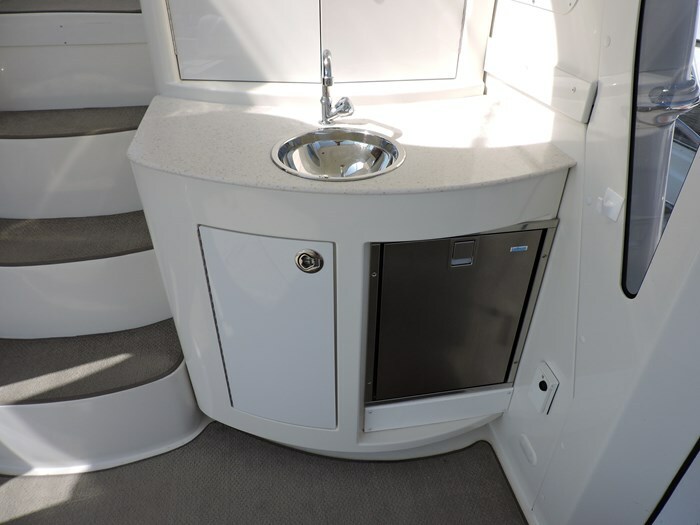 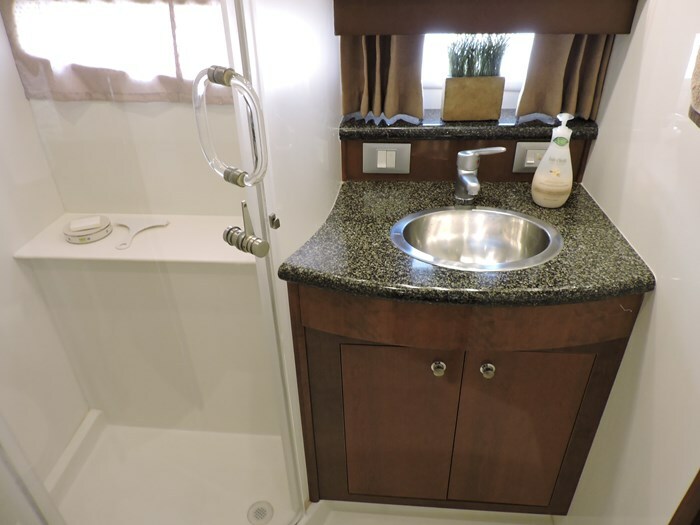 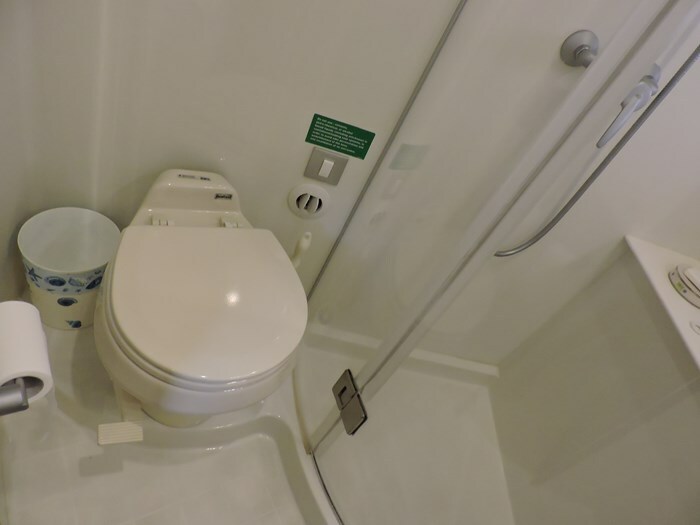 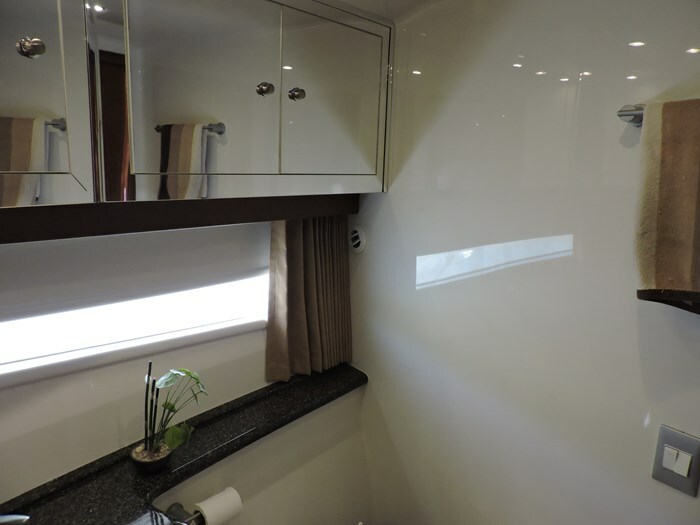 Guest Head-Vacuflush Toilet, Stall Shower, Exhaust Fan, Vanity, Sink, Mirror. 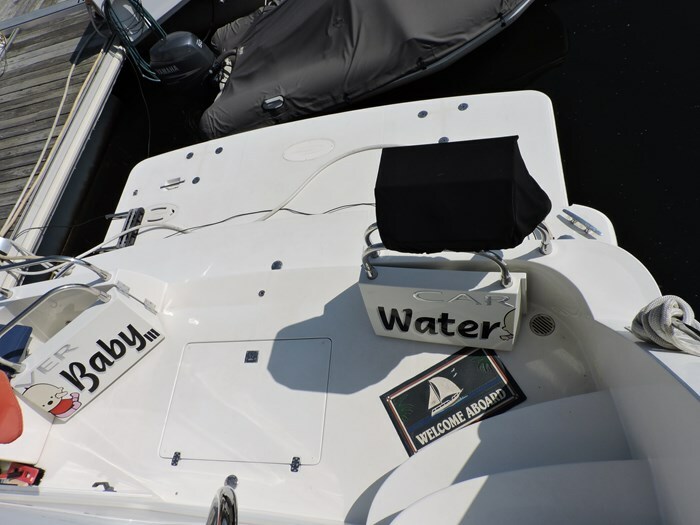 Safety-Anchor with Chain, CO Detectors, Dock Lines, Fenders with Adjusters, Fire Extinguishers, Halon System, Ring Buoy.